Thanks for our fans' love and great suggestions to our Counter Terrorist - Critical Strike(CT-CS). Our team has collected all the feedbacks and spent great effort in the last a few months to bring the "new boy" to our fans here. 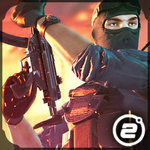 (Counter Terrorist 2) which combines our fans' and our team's great ideas. The game sports horribly unresponsive controls, the graphics are a clear ripoff of Counter-Strike and also lag a lot, the gameplay features an exaggerated difficulty level even in easy mode, and overall, the game is just unoriginal, boring, repetitive, and not any fun at all.